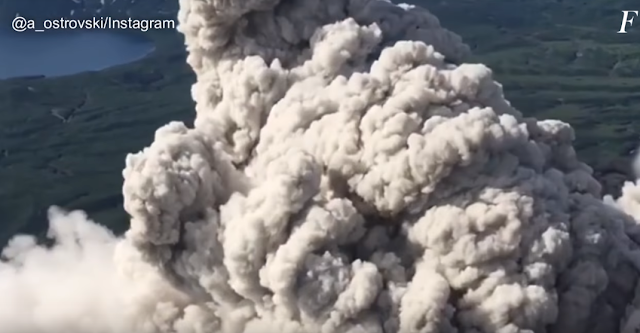 A helicopter tour guide filmed incredible high-definition aerial footage of a Russian volcano as it spewed plumes of ash into the sky. The eruption was so severe that a Volcanic Ash Advisory has been issued for the region. The Karymsky Volcano in Kamchatka, eastern Russia, is one of the most active volcanoes in the region - which is home to more than 100 active volcanoes. Local tour guide Aleksandr Ostrowski, 27, said he filmed the eruption while flying to the Valley of Geysers via helicopter. Plumes of ash from the volcano have spread for about 92 km according to the Kamchatka Volcanic Eruption Response Team (KVERT), who have categorized Karymsky's current state as orange, meaning "erupting or restless". Ash eruptions of up to 19,700 feet (6km) could occur "at any time", KVERT warns, which is likely to have an effect on low-flying aircraft. Previous eruptions from Karymsky have been described as 'Vulcanian'. Such eruptions can involve large metre-size rocks being thrown several kilometres into the air and usually end with a flow of viscous lava.